What is Priority Based Budgeting? Priority based budgeting is a best practice as recognized by the International City Managers Association (ICMA) and the Government Finance Officers Association (GFOA). Priority Based Budgeting begins with the line item budget and then adds two components, programs and results. Programs are services provided. Results are defined by the organization and align with its the goals, for example to have a thriving economy. A priority based budget associates costs from the line item budget to programs and evaluates programs according to the results. Programs are labeled as Community or Governance which defines whether they provide internal (Governance) or external (Community) services. Results are chosen and defined by each organization. Programs are scored by each result and evaluated using the definitions. If a program meets multiple definitions it is said to be achieving that result or shows a strong alignment with the result. There is a unique set of results for Community programs and Governance programs. 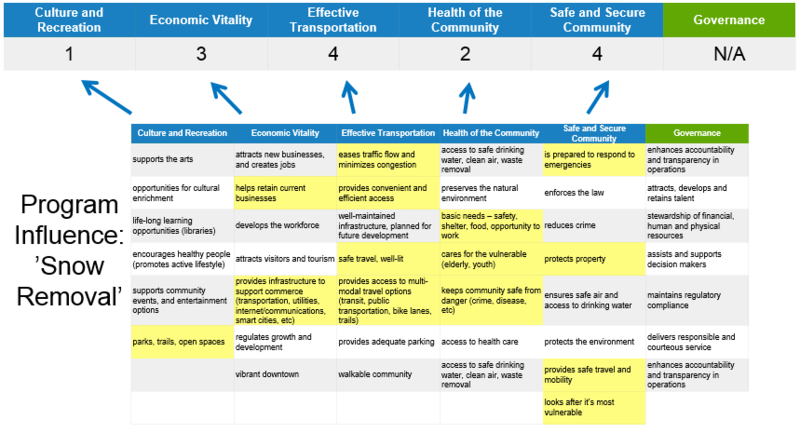 Economic Vitality is an example of a Community Result, it might have several definitions, such as: Develop a comprehensive approach to encouraging tourism or Prioritize and invest in strategic infrastructure construction that supports the City's economic development”. Below is shown an example how a program such as Snow Plowing might score across each result. Spending on Results shows how the overall budget is directed toward achieving results. This chart shows what part of the total budget makes a strong, some, or no contribution to a specific result. Each program is scored against all results so all three parts will equal the same amount. Use this chart to answer the question, What part of our budget contributes to a Safe Community? Or, to identify a result you would like to learn more about. Identify individual programs that contribute to a specific result. Filter using the radio button on Strong, Some, or None contribution to results. Then click the bars to move into the departments and click again to move to the programs. At the top, in the middle of the chart click to go back up one level. The scores to each result area for a program is shown at the final drill down level. Resource Alignment is allows us to view the results of the Priority Based Budgeting Process. The process provides us insight on how much we spend relative to our values. Programs are displayed in four categories - Most, More, Less, and Least relevance to our priorities. Explore the things we do that are highly relevant and the things we do that are less relevant, but still serve a purpose. Clicking a bar, will show programs making up each grouping, clicking the program displays the scores in each of the result areas. Above the chart is a link to click back up. Shows spending over budget cycles by relevance. Pie charts are displayed based on filtered criteria and include Program Type, Fund, Departments, and Program Funding. Lists all programs within the filtered criteria.